Vista Studio artist Stephen Chesley is one of ten artists being featured in Kleinformat/Small Format: The Columbia – Kaiserslautern Exchange at if ART Gallery, 1223 Lincoln Street. This exhibition runs from Friday, October 26 until Tuesday, November 13, 2007 and includes an opening reception on Friday, October 26 from 5 – 10 PM. Additional hours are: Weekdays from 11 AM until 7 PM and Saturdays from 11 AM until 5 PM. 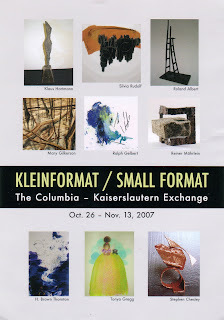 The exhibit features work by five South Carolinians (Mary Gilkerson, H. Bron Thornton, Stephen Chesley, Mike Williams, and Tonya Gregg) and five Germans from Columbia’s sister city, Kaiserslautern (Silvia Rudolf, Roland Albert, Reiner Mahrlein, Ralph Gelbert and Klaus Hartmann).